Today, we will be reviewing one of the best email migration software developed by the experts at SysTools Software. A group of distinctive individuals dedicating themselves towards the goal of simplifying technology. Let us learn a little about SysTools before moving on to the excellent product that is MBOX to PST Converter. Overview: SysTools Group is a private IT firm which has simplified the lives of millions of users around the globe with its innovative solutions. It focuses on providing users with smart and cost-effective risk management and business complaint data recovery solutions. It has a wide variety of 180+ products in the range of Data recovery, Digital Forensics, and Cloud Backup. Among these equally efficient and powerful tools lies our focus of the day that is SysTools MBOX to PST Converter. A comprehensive and stand-alone utility boasting a wide range of remarkable features to export multiple MBOX files to Outlook PST. It is a quick and effective solution for migration to Outlook without any risks of data loss. After thorough research and practical implementations, we concluded that the tool’s reliability and effectiveness are flawless. Also, it has the ability to generate excellent output results on every use. Therefore, we want to aware the readers about the perfect solution this software is for their Outlook migration needs. The software is developed to address the needs of both Windows and Mac users. Both the tools (for windows and for mac) are equally efficient in converting multiple MBOX files data including emails, calendars, tasks etc to PST format. The simple yet powerful interface provides users with an easy-to-use solution while generating desired results. Moreover, many advance and relevant features are incorporated into the tool. It directly results in maintaining its high performance throughout the conversion process. Let us take a look at some of these features in detail for both Windows and Mac versions. Install Lotus Notes 9.0 or below version for MBOX to NSF Conversion only. This software has the ability to export any file in MBOX format(supported by 20+ email clients) to PST format(supported by MS Outlook) easily. Also, the output data file is generated in UNICODE format. Hence, it is compatible with every Outlook version including the latest ones without any issues. Moreover, the entire conversion process does not involve any kind of data loss risks which shows the tool’s reliability. Note: The tool also supports MBOX files generated from Google Vault and Google Takeout service. Use the Add File button to import them. 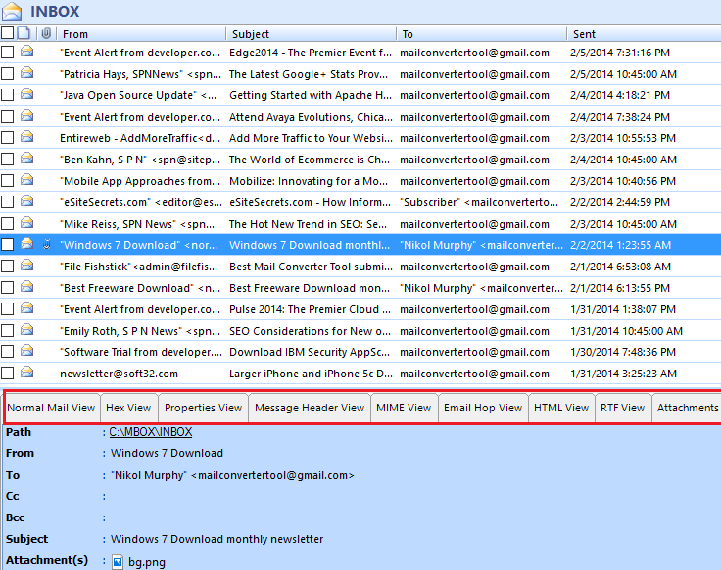 The utility can auto-detect data from seven major email clients for Windows. The supported email applications are Mozilla Thunderbird, MS Entourage, Eudora, Netscape Mail, PocoMail, SeaMonkey and SpiceBird. Users can also locate and import orphan MBOX files from the local machine manually. Default Profile Configured: Select this option if you want to scan and import data from the supported email clients. You can later choose if you want to fetch complete profile data or data from a particular profile identity. Select File(s)/Folder from File System: Select this option if you want to manually locate the mailbox file to fetch data from. 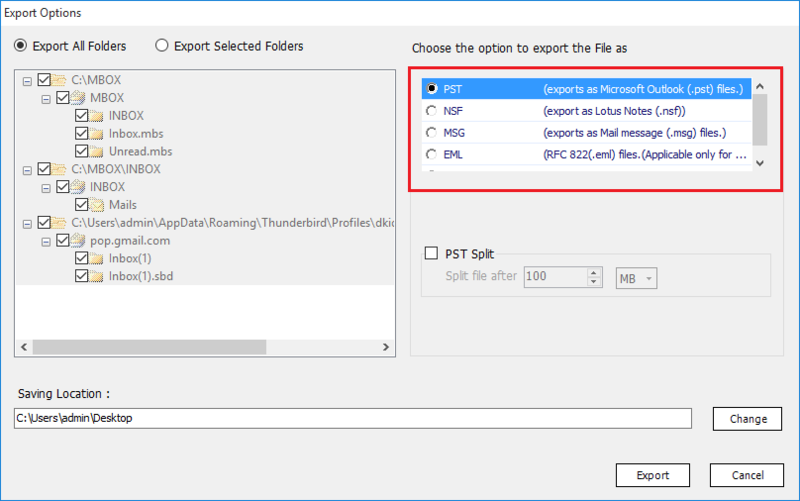 MBOX to PST converter tool has an option of using Folder Mode when importing mailbox files manually. With this option, users can add entire folders to fetch underlying MBOX files in bulk. Moreover, you can also choose to preserve the entire folder structure by selecting the maintain folder hierarchy option. These simple yet effective options eliminate any confusion for users after conversion. Once the files are added into the tool, the preview window displays the emails in an astonishing amount of eight different previews. Even the attachments can be viewed along with the previews. The supported views are Normal Mail View, Properties View, Hex View, Message Header View, Email Hop View, MIME View, HTML View, and RTF View. This is especially beneficial for users to view the emails before exporting. Also, the tool provides an option to skip the previewing of emails which tends to save a lot of time. Export All Folders: This option will convert all the data from every file or folder imported into the tool. 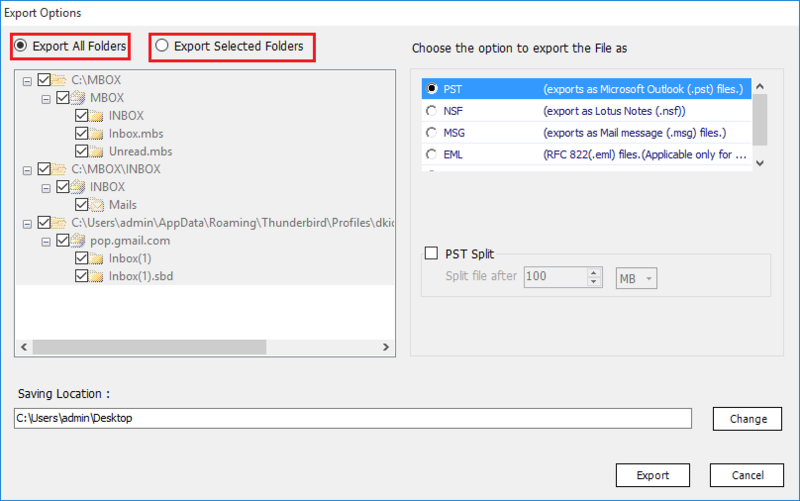 Export Selected Folders: This option will export data from only those specific file(s) and folder(s) selected by users. The capability of this utility is not limited to just converting MBOX data to Outlook PST. It can also export the .mbox(with or without extension) and .mbx variants to four other formats namely EML, MSG, NSF, and HTML. It goes to show the convenience of using the tool which supports multiple import clients as well as multiple export options. The utility for Mac supports the conversion of mailbox file data in bulk. Users can fetch data from single/multiple files by using separate options to add file and folder. 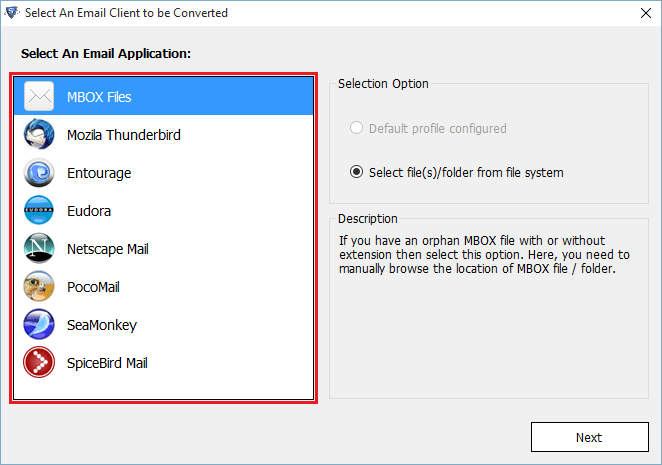 Add File(s): With this option, you can browse and select the particular MBOX file to import. 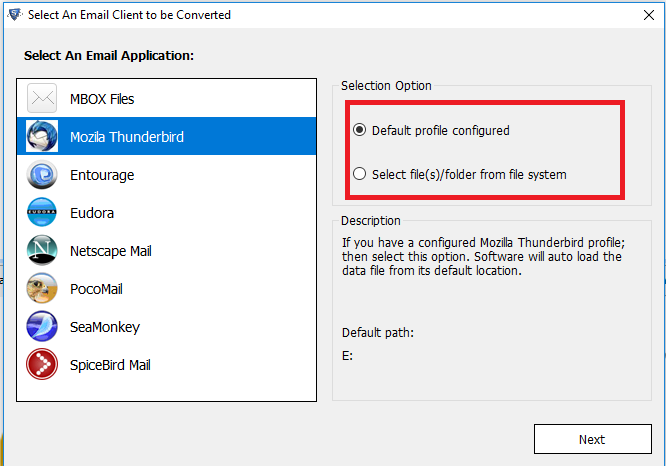 Add Folder(s): With this option, you can add a complete folder(s) to import the multiple mailbox files stored within them. 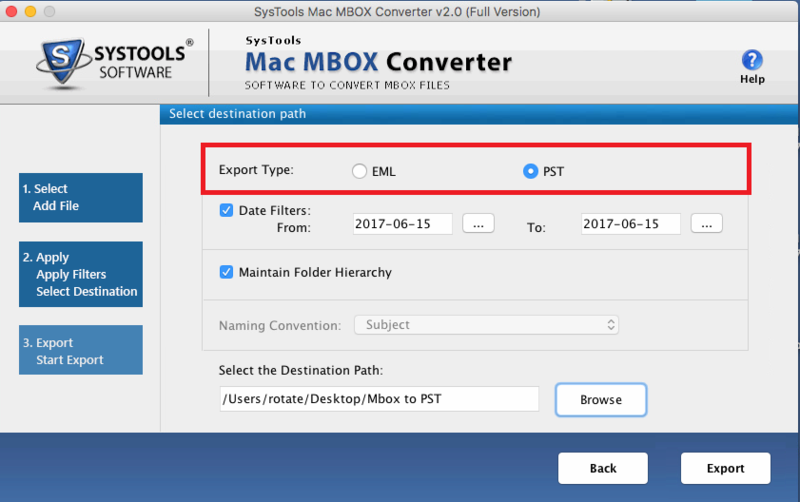 The latest version of Mac MBOX Converter that is V2.0 supports the option to convert multiple MBOX files to PST for Outlook as well as EML format. Users can choose the export options as per their requirements. This utility provides users with both Naming and Filtering options for a user-friendly experience. Date Filter: This inbuilt feature allows users to filter their email messages according to a specific date range. Naming Convention: This option lets users name all the exported data as per date, cc, subject etc. with ‘Subject’ being the default value. No harm is done to any metadata information or properties associated with the email messages throughout the conversion process. The software is capable of preserving the complete integrity of mailbox data without altering a single detail. Be its folder structure, attachments, HTML formatting or any other properties like cc, bcc, subject, etc. Everything is completely retained in the converted output files. 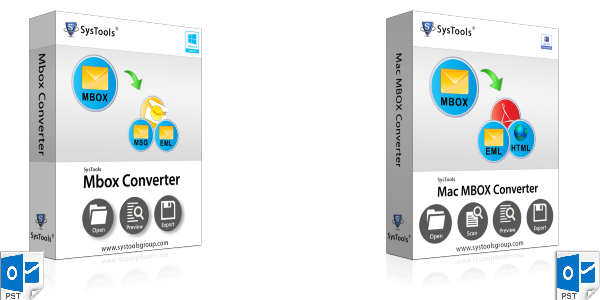 You can also download the freeware MBOX to PST Converter for both Windows and Mac platforms. Although, this free trial version only supports exporting 25 items/folder at a time. But, you can check the demo version to confirm its effective working yourself. Once satisfied, you can buy the license version anytime. 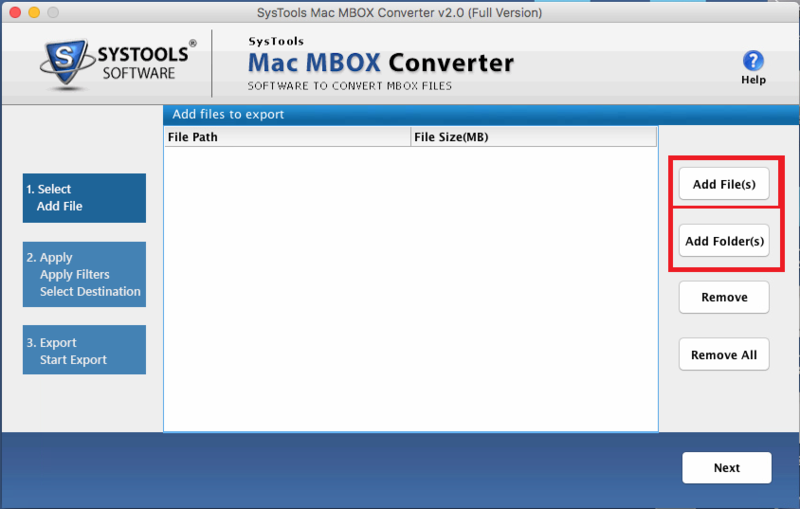 The software is also available to purchase in bundles form like MBOX Converter+ Mac MBOX Migrator. Users can opt for these bundle packages to avail better discount. The utility in itself is worth every penny. 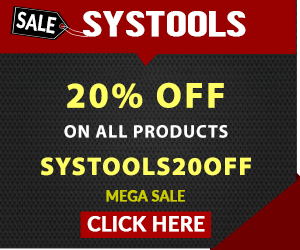 SysTools being the pioneer has developed many remarkable software solutions which are already helping millions of users worldwide. 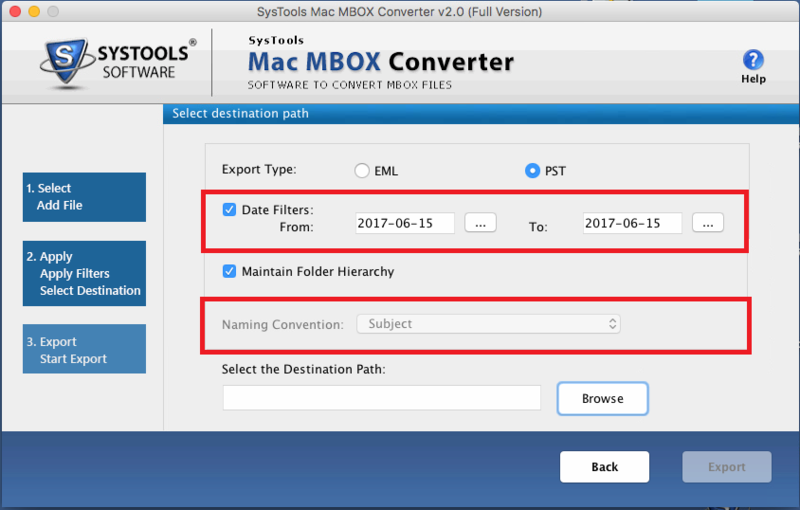 We reviewed one such application that is SysTools MBOX to PST Converter to export MBOX files supported by 20+ email clients to MS Outlook PST risk-free. Both the performance and reliability of the tool has remained unmatched by any other similar tool. Its user-friendly interface laced with effective and relevant features constitutes a powerful utility. Which is why it deserves a rating of 9.8/10 considering all the aspects of email migration it covers.